On 7 October 2016, U.S. President Barack Obama signed Executive Order 13742 headed “Termination of Emergency with Respect to the Actions and Policies of the Government of Burma” (E.O. 13742)1. E.O. 13742 revoked all previously un-repealed measures which had formed part of the U.S.’s sanctions regime against Myanmar. The repeal of sanctions represented the culmination in a period of rapprochement between the U.S. and Myanmar which began in 2010 when Myanmar’s military Government initiated political and social reforms and take the first steps towards democracy. The removal of sanctions is expected to lead to renewed interest in foreign direct investment in Myanmar. To date, investors in Myanmar have had to undertake extensive research into prospective investments in Myanmar to ensure they would not be in violation of U.S. law. Sanctions were a cornerstone of the U.S.’s foreign policy position towards Myanmar for almost two decades. The sanctions programme, implemented by the Office of Foreign Assets Control (OFAC), commenced in May 1997. Through Executive Order 13047 (E.O. 13047) the U.S. Government asserted that Myanmar’s military junta had committed large-scale repression of Myanmar’s democratic opposition and declared a national emergency (Emergency) in respect to the junta’s seizure of power.2 E.O. 13047 was followed by numerous other Executive Orders as well as legislative and administrative measures to amend, expand, modify and re-issue sanctions. Certain U.S. states introduced unilateral sanctions measures. A key instrument in the U.S.’s sanctions regime was the use of a ‘blacklist’ (SDN-List) to target officials from Myanmar’s former military junta, and companies owned or controlled by such individuals3. In 1990, E.U. member states made an informal non-binding commitment to introduce an arms embargo against Myanmar. This commitment was reconfirmed in a Common Declaration of the General Affairs Council on 29 July 1991 and adopted as part of the E.U.’s Common Position (Common Position) on Myanmar in October 1996.4 The E.U.’s arms embargo included weapons ‘designed to kill’, certain ammunition, weapons platforms, non-weapon platforms and ancillary equipment, spare parts, repairs, maintenance and transfer of military technology. Contracts entered into prior to the date of the Common Position were not affected. Between 1996 and 2012 the E.U. regularly renewed its ‘restrictive measures regime’ sometimes modifying it to extend its ban to the provision of certain other goods and services.5 In May 2012, the E.U. suspended most of its ‘restrictive measures regime’6. (The arms embargo has been retained and will remain in place until at least 30 April 2017). Certain other countries imposed unilateral sanctions against Myanmar. These included Norway (2007 – 2011), Switzerland (2012), Canada (2011 – 2012) and Australia (2007 – 2013). Japan cut aid to Myanmar in October 2007 following the death of a Japanese journalist covering anti-government protests. Japan resumed its Myanmar aid programme in May 2008 in the aftermath of Cyclone Nargis. New Zealand imposed a visa ban on Myanmar’s military leaders and their families. E.O. 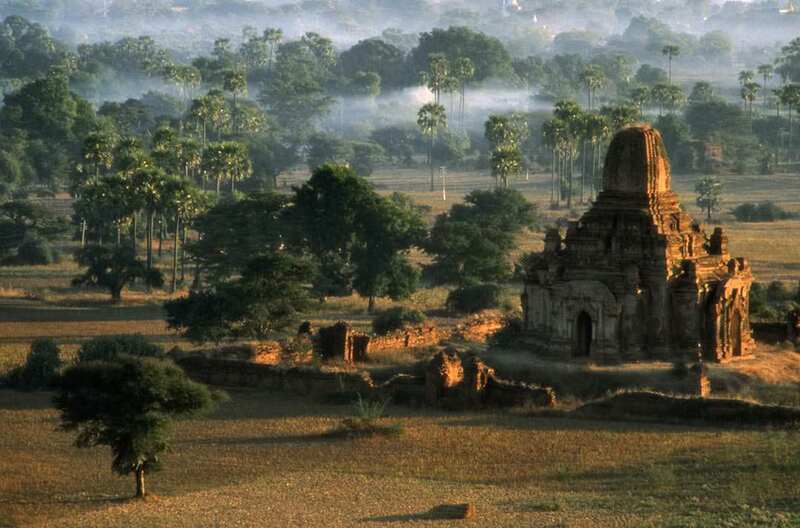 13047 20 May 1997 Prohibition on new investment in Myanmar by U.S. persons. Tom Lantos Block BurmeseJADE (Junta’s Anti-Democratic Efforts) Act of 2008 29 July 2008 Imposed sanctions on certain categories of persons; enumerated importation ban to prohibit the importation into the U.S. of Myanmar jadeite or rubies or jewellery containing jadeite or rubies mined or extracted from Myanmar. beginning the process of a targeted easing of the ban on the export of U.S. financial services and investment as part of a broader effort to help accelerate economic modernization and political reforms. On 11 July 2012, OFAC issued General License No. 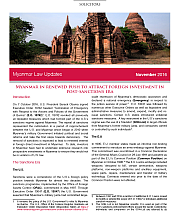 16 (GL 16) authorizing U.S. businesses to export financial services to and make new investments in Myanmar. U.S. persons remained generally prohibited from dealing with any sanctioned individuals and companies on the SDN-List. Under the licence system “new investment” was defined to include entering contracts, purchasing equity interests, and participating in royalties, earnings, or profits involving the economic development of resources in Myanmar. Any U.S. persons whose aggregate new investment in Myanmar exceeded US$500,000 (later increased to US$5,000,000) were required to comply with the State Department’s Responsible Investment Reporting Requirements. Such investors were required to file reports with the State Department on an annual basis, including a publicly available version. These reports were required to include information regarding the invested company’s policies and procedures with respect to human rights, workers’ rights, environmental stewardship, land acquisitions, arrangements with security service providers, and aggregate annual payments exceeding US$10,000 to Myanmar Government entities, including state-owned enterprises. Investors were also required to notify the State Department if they entered into a transactional relationship with the Myanma Oil and Gas Enterprise. On 26 September 2012 it was announced that in recognition of the Myanmar Government’s continued reforms and in response to requests from both the Government and opposition, the U.S. would adopt additional measures to normalize its commercial relationship with Myanmar. General License No. 19 issued by OFCA 22 February 2012 Asia Green Development Bank, Ayeyarwady Bank, Myanma Economic Bank, and Myanma Investment & Commercial Bank permitted to engage in financial transactions with U.S. institutions. General License No. 14-C issued by OFCA 17 April 2012 U.S. entities permitted to deliver financial services for the purpose of humanitarian, religious, and other non-profit activities. Executive Order 13619 11 July 2012 OFAC issued general licenses authorizing U.S. businesses to export financial services to and make new investments in Myanmar. Executive Order 13651 6 August 2013 Revoked the provisions of E.O. 13310 which implemented the Burmese Freedom and Democracy Act which introduced a ban on importing goods produced in Myanmar. lifted the import ban on rubies and jadeites of Myanmar origin into the U.S.
Additionally the U.S. announced that it would restore its Generalized System of Preferences (GSP) on trade to Myanmar in response to progress in a number of areas, including the strengthening of worker’s rights. Myanmar is to be re-designated as a ‘least-developed’ beneficiary country under the GSP programme. Further to the lifting of sanctions and the restoration of the GSP the U.S. Government adopted the Burma Strategy Act of 2016 (Strategy Act) to provide additional support to facilitate Myanmar’s political transition and economic growth. The Strategy Act provided for the establishment of the Win Tin Burma-American Enterprise Fund. The objective of the fund is to incentivise private sector investment in Myanmar. The Strategy Act further permitted the giving of support to entities and individuals in Myanmar to help them meet GSP eligibility criteria. Ms Suu Kyi acknowledged there with risks associated with the end of the sanctioning regime. Speaking of the U.S.’s decision Ms Suu Kyi stated “In some ways it is a risk, it as much a political risk as an economic risk, because there are those who believe it is not yet time for us to remove the sanctions, but we think that it is time now for our people to depend on themselves, to go forward with the help of our friends.” Ms Suu Kyi had been a long-term advocate of economic sanctions as a means of pressurising Myanmar’s military Government to implement democratic reform. The lifting of sanctions represents a risk as Myanmar’s military has not yet surrendered its interest in politics and continues to refuse to consent to the amending of Myanmar’s 2008 Constitution. The 2008 Constitution enshrines the army’s political role by guaranteeing it 25% of the total available seats in Myanmar’s Parliament and independent control over the Ministers of Defence, Home Affairs, and Border Affairs, and allows the military to dissolve the Myanmar Government during a national emergency. There is a risk the lifting of sanctions will lead to the enrichment of former high-ranking military generals who were previously on the SDN-List and who maintain extensive private interests in industries such as jade mining and logging. The non-profit human rights organisation Human Rights Watch (HRW) has been critical of the decision to end the sanctions. HRW argued “sanctions are crucial for pressing the military to end rights abuses and transfer power to a civilian government.” HRW has argued that sanctions should continue until the transition to democracy has become irreversible. The lifting of sanctions has prompted renewed calls for foreign investment in Myanmar. Foreign investment in Myanmar has declined since the country’s democratic elections in December 2015. Total foreign investment in Myanmar in the three months ended 30 June 2016 was US$380 million down significantly from US$2.6 billion in the corresponding period in 2015. Speaking to the U.S. ASEAN Business Council on 15 September 2016, Ms Suu Kyi urged businesses to invest in Myanmar as a way to advance its democratic transition saying “Economic success is one of the ways that we can persuade everyone in our country, including the military, that democracy is the best way forward for our union” and added that “In order to make the political transition work, we have to have the economic expectations of our people fulfilled as well”. The use of economic sanctions as a tool to affect policy and behavioural change (political, social, and ideological) within and among nation states and organisations pre-dates the Peloponnesian War. They remain a hugely popular policy instrument, although historically, they have had mixed success. The relative success of individual sanctions programmes (which can include a wide range of sanction types and targets) is dependent on a substantial number of variables, which include, but which are certainly not limited to, whether or not the target can offset, avoid, circumvent or simply endure the sanctions imposed against it; the effect of sanctions on the target’s populace (most notably on public health, employment and education, but also on national opinion); sanctions enforcement (which typically assumes a certain level of multi-lateral cooperation among states, corporations, and other entities; and which can involve extensive and continuous monitoring); the cost of sanctions to the sanctioning party as well as to third parties; the sanctions mix (i.e. the use of punitive sanctions and rewards – the “carrot and stick” approach); the size and sophistication of the target’s economy and trading capabilities; the populace’s access to information through the media and other channels; the rule of law in the target country; and the manner and extent to which the government in the target country exercises power and control over military and security forces. It is necessary to consider all of these variables, among many others, when determining on a case-by-case basis whether or not sanctions are a suitable tool to achieve a specified goal (or goals). Even if a particular goal is achieved, it does not automatically follow that sanctions were responsible for effecting the sought after change. Sanctions were imposed against Myanmar as a means to achieve different objectives. Primarily they were intended to pressurise the military into relinquishing power to a democratically elected Government. Certain other sanctions were ancillary to this goal, for example, the arms embargo sought to undermine the military by preventing it from accessing modern armaments and reducing its capacity to supress civil unrest and regional conflicts within Myanmar. The SDN-List, along with other initiatives, was used to frustrate the business interests of certain individuals linked to the junta. Other ‘targeted-sanctions’ were a response to Myanmar’s poor performance in respect to illegal drug trafficking and production, the use of child and slave labour, child conscription into the military and the working conditions in state-owned mines. The key objective of sanctions – the transition to democracy – can be said to have been achieved. However, it should be noted that the 2008 Constitution enshrines the military’s role and right of participation in the Government. The transition to democracy cannot be said to have completed until such time as the 2008 Constitution has been amended to guarantee civilian rule and ensure the democratic status quo endures. Previously the U.S. had made the amendment of the 2008 Constitution a pre-condition to the lifting of sanctions. A more definitive analysis of whether sanctions have helped deliver lasting democracy in Myanmar will have to wait. Evaluating the relative success or failure of the different ‘targeted’ sanctions imposed as part of the general sanctions regime against Myanmar is complicated by a lack of verifiable information upon which to base an analysis. Similarly most sanctioning legislation did not set out criteria, methodologies or standards for analysing the change effected during the sanctions period. It is not possible to say how the wealth of Myanmar nationals on the SDN-List has been affected. The financial information of sanctioned individuals is not publically available. Moreover the lost ‘opportunity cost’ of sanctions cannot be quantified. 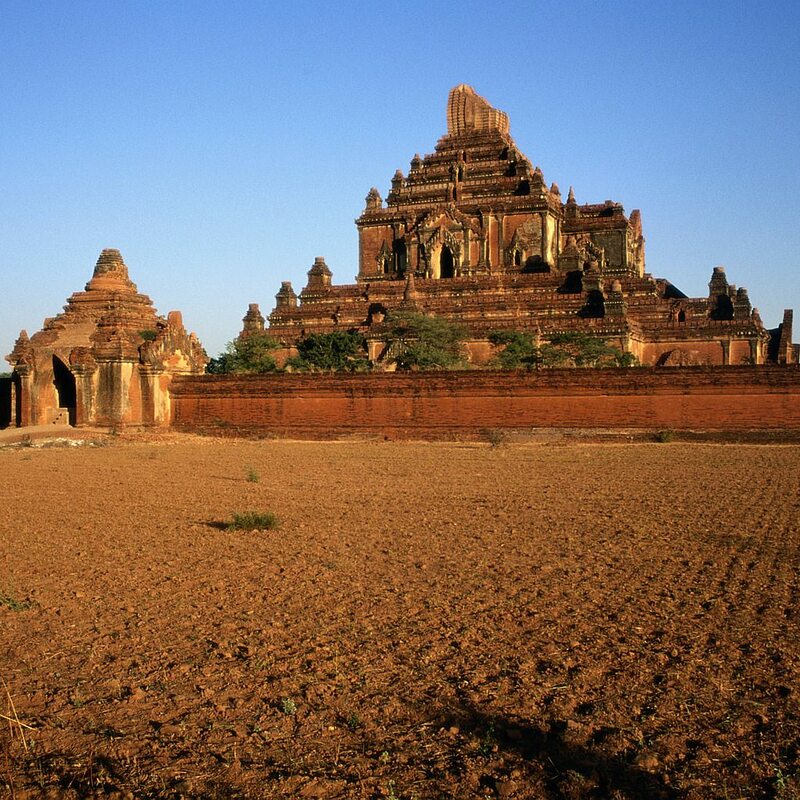 Myanmar nationals on the SDN-List were not restricted from engaging in business generally within Myanmar and may have been able to consolidate and build on their business interests, despite the impositions of sanctions. The arms embargos certainly limited the sources from which the Myanmar military could source armaments but it did not frustrate their efforts completely. During the sanctions era China, India, Serbia, Russia, Ukraine9 and Israel10 supplied arms to Myanmar. Sanctions targeting drug trafficking do not appear to have been successful. In 2015 the United Nations Office on Drugs and Crime reported that Myanmar remains the world’s second largest opium producer after Afghanistan. Similarly sanctions do not appear to have had a material effect on the use of child labour in Myanmar. They may have influenced the Government’s decision to ratify the International Labour Organisation’s “Worst Forms of Child Labour Convention, 1999” which calls for the elimination of the “worst forms of child labour”, including slavery and the use of children in hazardous work and armed conflict, however, according to the Myanmar 2014 census over 1.5 million children between the ages of 13 and 17 (or 21% of all 13 – 17 year olds) were part of the labour force. 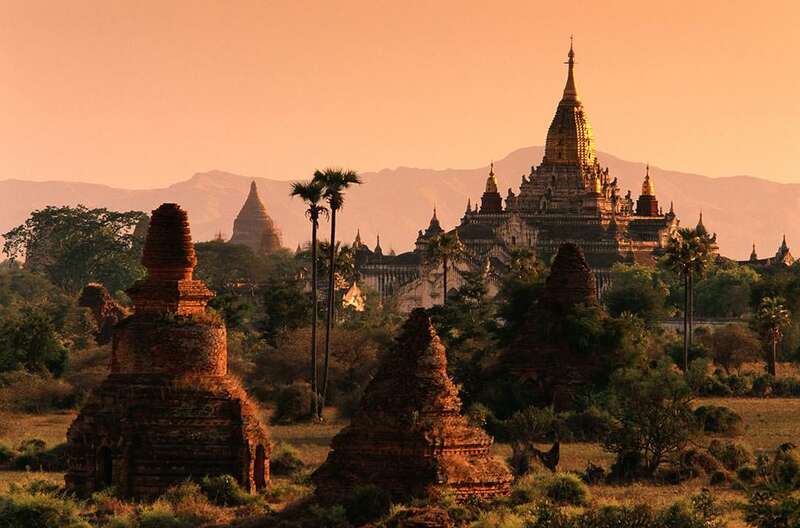 1 It remains the policy of the U.S. Government to refer to Myanmar as Burma. The U.S. Office of the Federal Register maintains an Executive Order Disposition Table (Disposition Table) at https://www.federalregister.gov/executive-orders/barack-obama/2016. The Disposition Table contains permalinks to the text of each E.O since 1994. 2 Between 1997 and 2016 a number of additional E.O.’s were issued to modify or amend the scope of E.O. 13047 or introduce additional sanction measures. 3 The SDN List is not Myanmar specific. It is used as part of the U.S’s sanctions enforcement efforts around the world. Collectively, individuals and companies on the SDN-List are referred to as “Specially Designated Nationals” or “SDNs”. 8 Secretary of State, “Recognizing and Supporting Burma’s Democratic Reforms,” press release, 4 April 2012. Import ban on rubies and jadeites of Myanmar origin into the U.S.